It's the beginning of February! I have a friend who tells me that the ancients considered February to be the beginning of spring. I acknowledge that by temperature we are still in the depths of winter, but my heart wants to leap to spring. And there are definitely signs that we are turning toward the equinox - the sun is up earlier and down later; the cardinals are singing their spring morning song; the sun is warmer. So here's a skirt that celebrates just where we are - it's felted and warm for winter, but looks bright and springy. It reminds me of the old "Grandmother's Flower Garden" quilts. 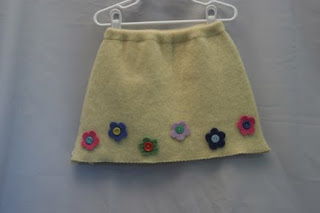 It's made from a recycled, felted sweater, and the flowers are scraps from lots of other recycled sweater projects.